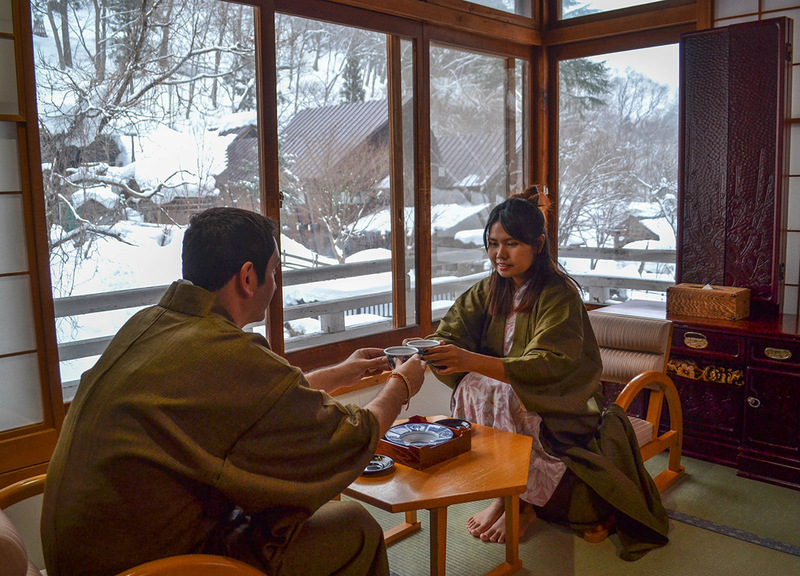 The one experience not to be missed in Japan, for me, is the traditional ryokan experience, which is more than just your typical hotel stay, but a package of must-do cultural experiences, all wrapped into one. This normally includes a traditional hotel suite, with frills attached, the hot spring baths, complimentary kimono dress, and, more than not, a multi-course kaiseki dinner. 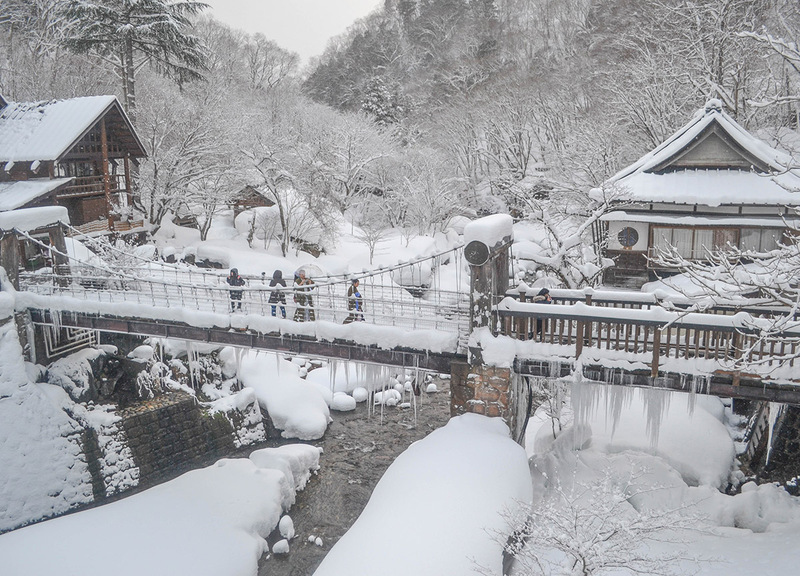 I have said similar with past ryokan stays, but Takaragawa Onsen in winter was more. For me it was the Japanese dream, where, other than on-screen, I never thought places like this existed in real life. But what really brings this experience together is the setting next to a mountain stream, surrounded by mists of the hot water springs, and forests bound with snow. It is dreamlike and I’m fairly certain that they are the most beautiful and serene scenes I have witnessed in my life. And this is not me overexaggerating. 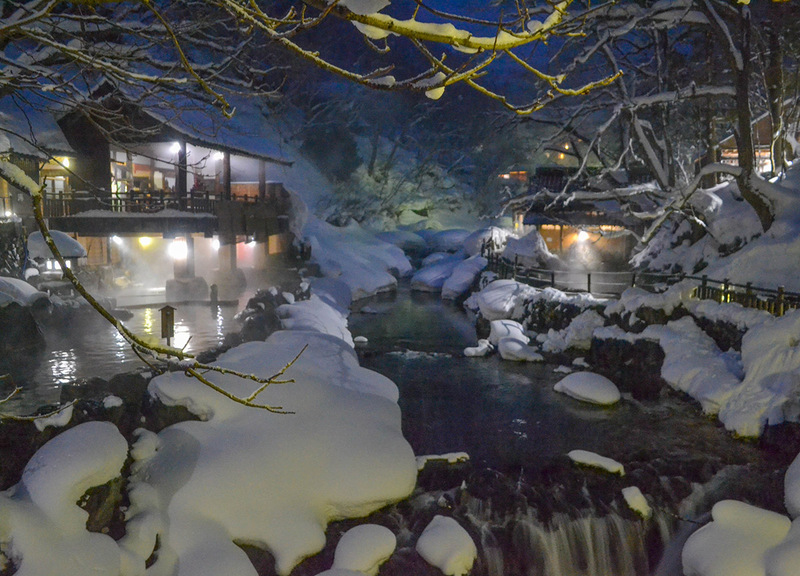 I could happily live and die at Takaragawa Onsen, but for now I just feel privileged to have experienced such a place, even it was just for one night. But what makes this setting even more unbelievable is the we started this morning with grey skies and rain in Tokyo, two hours away. Ten minutes before arriving to Jomo-Goken station even, there was barely a sign of snow. In fact ten minutes before arriving to Jomo-Goken station there was barely a sign of snow. Yet, emerging from the final tunnel of the journey, we are transported to a winter wonderland. 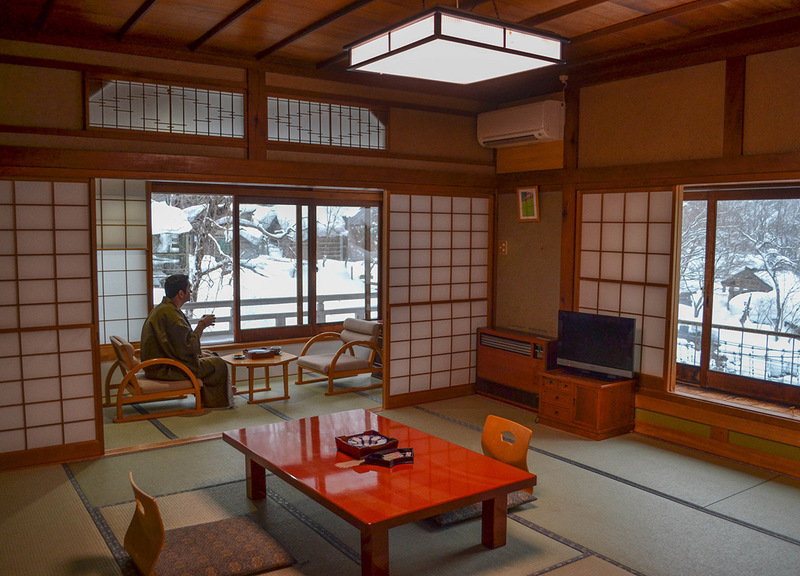 During our stay we are in the Jizo Room, located in the main building, built in 1955, which remains very traditional yet still has the modern essentials such as air-conditioning and washlets (robo-toilets). So we do have the best of both worlds as our guestroom suite is otherwise very traditional with tatami mat flooring, sliding door partitions, and interiors of old native pine wood. 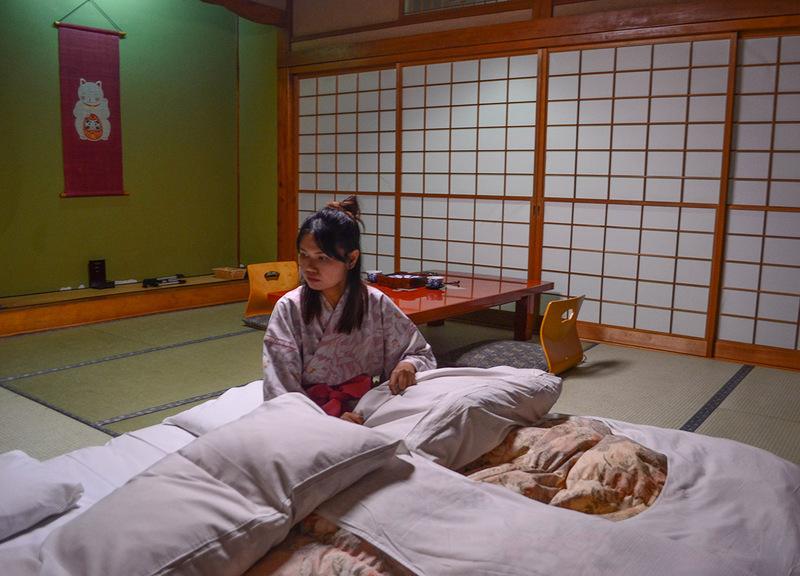 The tatami floors feel soft and spongy, heated from below, so the suite is just ridiculously cosy and hard to leave. In the center of the room is a shin-height table with seats with no legs, which are more like cushions with backrests, so we are sat at floor height, which again is surprisingly comfortable. Our suite is on the corner of the building where a second small seating area is partitioned by the corner windows to allow for incredible views over the passing Takarawaga river and suspension rope bridge, which marks the start of the forest walk to the hot spring onsens. The layout of the room does change in the evening, follow what I guess is a Japanese turn-down service, where we return from our kaiseki dinner to find two futon beds spread across the tatami flooring. Our shoes are taken from us when entering the ryokan, and are placed in safe keeping until we leave again. In return we are given indoor shoes, which are a bit like slippers, for use in the ryokan. We are also given a choice of yukata for our stay which is like a casual Japanese kimono and most people will wear these in and around the ryokan, as well as for sleeping in bed. We also find tanzen overcoats in the wardrobe, which wrap over the inner yukata, and are used when venturing into the colder weather outside. Of course these will change with the seasons where a lighter hanten is offered during spring and autumn, but being winter, and given the snow outside is as tall as I am, we need something heavier to wear. We also wear these jackets for much of our time inside as we left the windows open to listen to the sounds of snow fall and the passing torrents of stream. When visiting the onsens we must again change shoes where the option of either welly boots or traditional geta shoes, which are a bit like a combination of clogs and flip-flops, are found next to the doors at the gateway bridge. And I did somewhat expect to freeze outside, given our attire, and the minus temperatures, and the snow, so I was surprised to be comfortable and warm even. 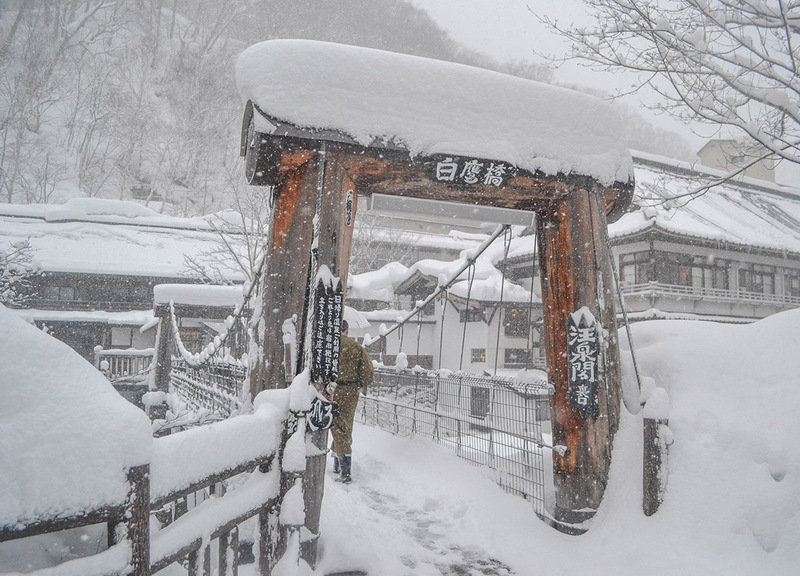 There are also transparent umbrellas found throughout the resort, to shelter from the snowfall and the mini avalanches from roofs and branches above, so you can just grab one at the nearest building or onsen if needed. In the cupboard we find towels and hand towels for our visits to the hot spring onsens, along with bathing clothes for the women. Then by following the short suspension rope bridge we are led to the beginning of the forest walk to the hot spring onsens. 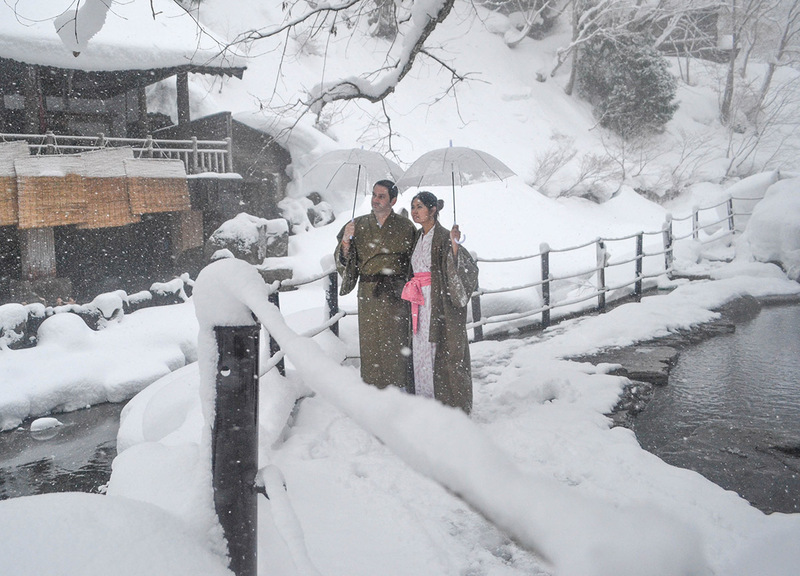 The outdoor onsens, or roten-buro as they are known, are dotted through the surrounding forests and connect neatly along the passing river, as we follow downstream. 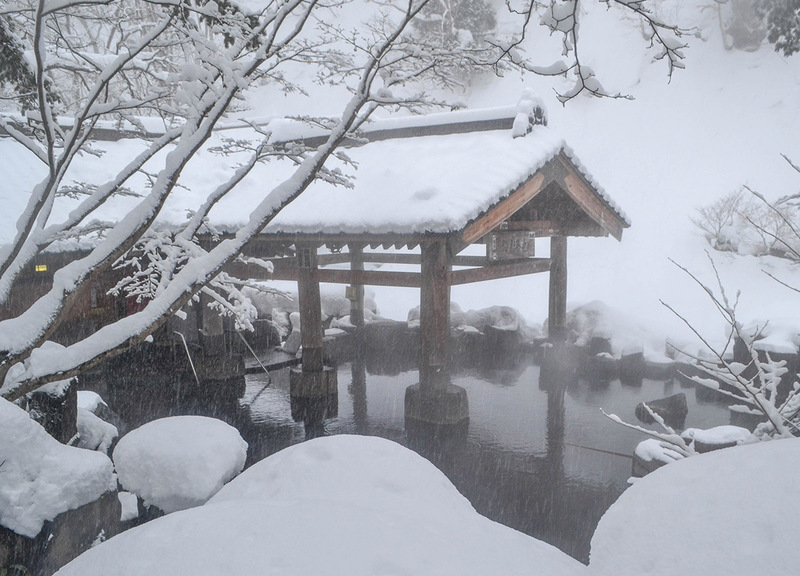 They are all of course natural onsens, with hot spring waters sourced from surrounding grounds and mountains, and there are four baths in total. Three shared between men and women, and then a further bath specifically for women. Next to each onsen are changing rooms, indicated by a blue curtains for men and red for woman, to leave clothes and belongings during dips in the onsens. There is also a towel bin next to these to discard of wet towels. Men are expected to bathe completely naked, as with most onsens, although the small hand towel will make do for the shy. For this reason photography is prohibited in the onsens although it seems to be okay through the grounds surrounding them. But despite the ryokan being fully booked through our stay, we found ourselves alone for most of the time, so it was no problem sneaking some photographs when no one’s around. 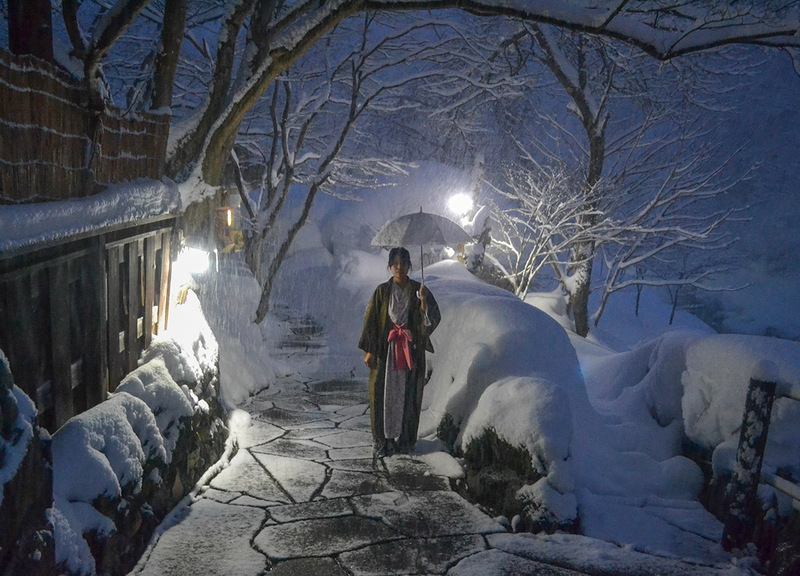 The baths are also open 24 hours so there will be plenty of opportunities to photograph if desperate and we found ourselves out at ridiculously early hours, before sunrise, when the entire forests and onsens are still and silent. We eat at the Chikutei restaurant in the same pine wood building as we stay, and similarly it is designed in a traditional Japanese style with bamboo borders, cloth partitions, tatami flooring and soft light lanterns. 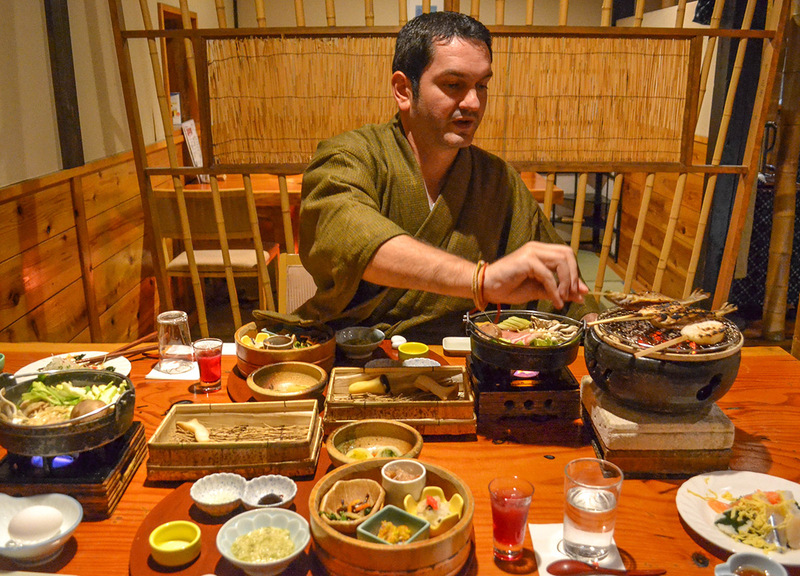 The kaiseki dinner, which is like a traditional multi-course Japanese feast, is prepared with ingredients sourced from the surrounding forests, including wild mushrooms, freshwater fish and apparently bear. Bear soup is one of the more intriguing of dining options although I really am not certain if we ate some. 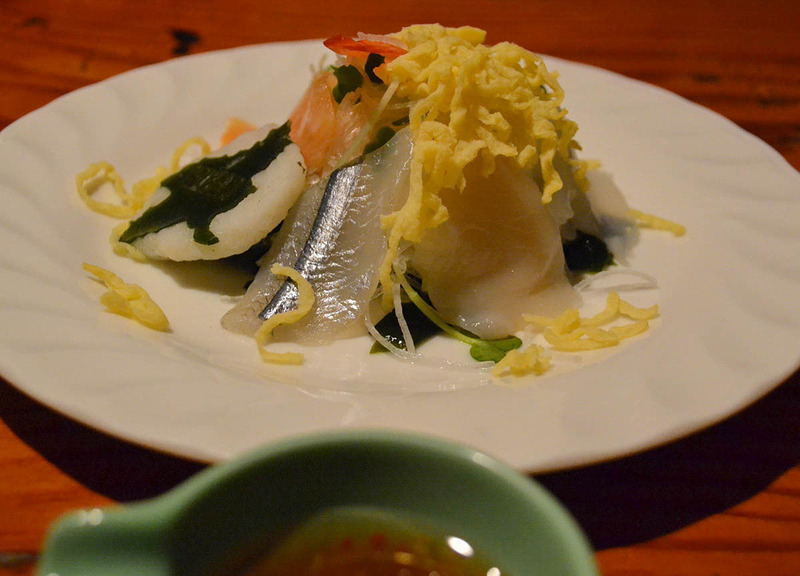 As with almost every kaiseki we have been part of, there was all sorts of weirdness on the table. To name some of the more obvious, there was sashimi, tempura, a table barbecue, and a suki-yaki hot-pot which was phenomenal, a word I don’t think have ever used before. 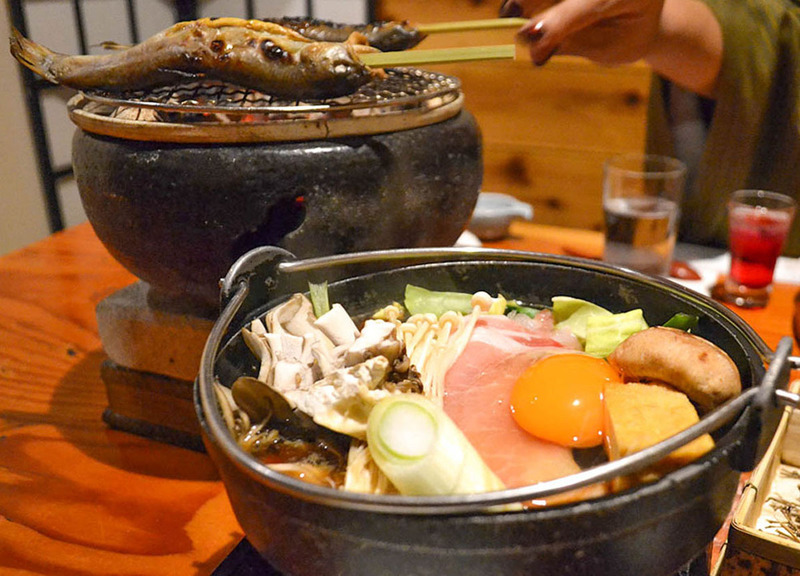 It is deserved here as normally I am not so fussed for suki-yaki hot pots. Having smuggled in wine earlier,to relax before our first onsen dips, we otherwise skipped on alcohol during our stay, although there was an exciting list of hot sakes and hi-ball mixes on the restaurant menu. And there was minimal markup on these which seems to be the norm in Japan. Thanks for this write up. My wife and I will be going there in about 10 days and are looking forward to the privacy the winter might afford.